Home What Pedal or Pedals Defines Your Sound? I’ve been thinking about this question on and off over the last few months. I’ve been thinking about this when I reflect on past musical projects/bands that I’ve been in. I’ve noticed that depending on the project, my guitar tone – amps, guitars and pedals all need to to evolve to fit the sound the of the band. When I start or join projects, it’s about adapting with the players to develop a sound together. Forming a unified direction, whatever it may be. Some players have a hard time with this concept, and only seek projects that fit their style perfectly. I always look at this as a challenge. Listen to the music, find that niche inside and own it. To do this, may require gear changes and playing style changes. For me, it’s much easier to change the gear than my technique. Looking back at various projects, I do see a foundation of gear, specifically pedals, that defined my sound for that project. 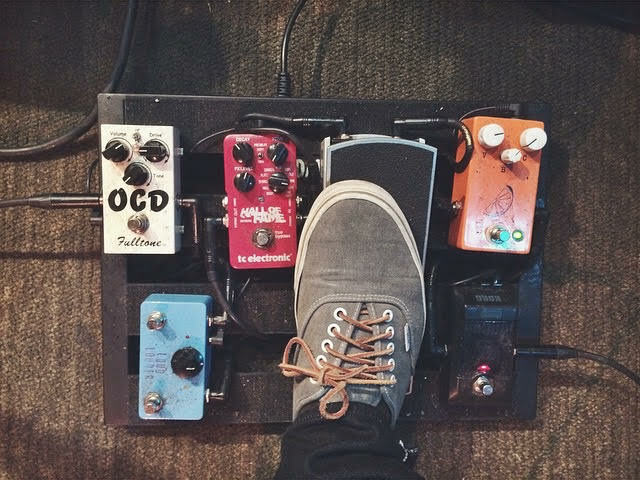 Curious, in the band that you’re currently in, what pedal or set of pedals forms your tone for that band? It’s similar to the deserted island question. Basically, if you didn’t have these pedals, you would have a difficult time filling your duties as a musician in that band? Or are pedal insignificant for you? Right now, my set up is largely dependent on Strymon BlueSky Reverb for rhythm tones, and for lead line stuff.. Earthquaker Dispatch Master. If I didn’t have these, I could still get it done.. but I would not be very happy about it. Let me know by commenting below! I think probably a Klon variant as a low-gain, tone-shaping boost. On both my boards, I have something like that as an always on pedal to shape my tone. And since i play through a pretty a tube amp with a pretty simple circuit – i always like to have a reverb pedal on. Most definitely the JHS Morning Glory Overdrive. So transparent, so clean, so beautiful. I love it. Might be cheating because it's two pedals, but a TS-9 on high gain in front of a Fuzz Factory on low gain. I guess my ones should be a Zen and the Whammy V. The Zen is on a lower gain setting while the Whammy often fattens up mixing a little bit of suboctave to the signal. Mention must be made my amp is set up to cut the mids a little. At the moment, I have two – my Boss CS-2 Compressor and my Danelectro Reel Echo. Of course my pedal chain(s) is/are much larger than those two, but these serve as the core. I have a 3 channel tube amp setup (clean, crunch, high gain). I get the most tonal flexibility by putting an Analog Man Beano Boost first (thanks Hank! ), and then a Boss Super Overdrive Keeler Mod behind it. I never run both at the same time, but for gain boosts on any of the channels I can get about 5 or 6 distinctive tones using either one that I will use consistently throughout a gig. Actually, I buy and use pedals so I can sound different every time I record. I don’t play live. Dwarfcraft Eau Claire Thunder, the best fuzz out there IMO and Boss DD3 for everything else. Hermida zendrive, Fulltone OCD, Fulltonte Octafuzz, EHX memory man. I play in a few projects/bands and the most important pedals that define my sound for all are the fulltone fulldrive and my líne 6 dl4! Spaceman Aphelion & Sputnik are what I use most for dirt but I the Keeley Compressor and GC-2 are on all the time at opposite ends of my board. I use a Barber LTD for overdrive, a smallfry for distortion,and a tone press for clean boost and some times compression. I also have a BBE sonic stomp and a Boss dd3 for delay. Sometimes I also use a Homebrew psilocybe for phase shifting. Planet waves pedal tuner and a Barber Trifecta for Fuzz tones. I could do with a fat distortion and a solo boost but one thing I love is to have a treble booster driving the main distortion. Eventide Pitchfactor– I use the stereo micro-detuning to make my L/wet-Center/dry-R/wet rig sound HUGE without the typical stereo chorus swirly wooshyness. Neunaber Chroma does this well also, but you can really tune the Pitchfactor to the precise detuning. That pedal for me is a Swell B-Drive (bass tube OD). It has two gain stages, and I always have the first gain on for a little bit of grit. I set the second gain up much higher to give me that extra bite when I need it. It's incredibly sensitive to my dynamic playing and I am always getting complements. They don't make these pedals anymore, so I'll be very sad if mine ever bites the dust.